IS THE GIN COMMUNITY READY FOR BOTANICAL SPIRITS? 100% for Charity Easy & Aﬀordable Top Industry Judges What Could Be Be�er? WHAT’S NEXT? 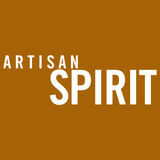 Sherry believes that the future of botanical spirits is in the craft distiller’s court. 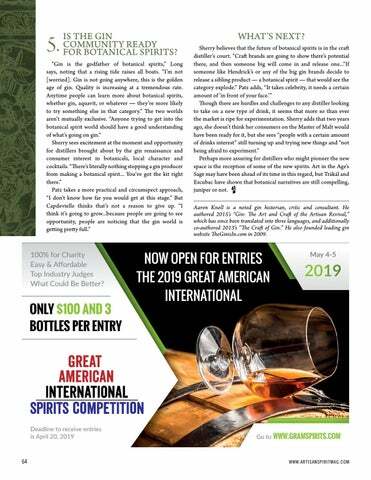 “Craft brands are going to show there’s potential there, and then someone big will come in and release one...“If someone like Hendrick’s or any of the big gin brands decide to release a sibling product — a botanical spirit — that would see the category explode.” Patz adds, “It takes celebrity, it needs a certain amount of ‘in front of your face.’” Though there are hurdles and challenges to any distiller looking to take on a new type of drink, it seems that more so than ever the market is ripe for experimentation. Sherry adds that two years ago, she doesn’t think her consumers on the Master of Malt would have been ready for it, but she sees “people with a certain amount of drinks interest” still turning up and trying new things and “not being afraid to experiment.” Perhaps more assuring for distillers who might pioneer the new space is the reception of some of the new spirits. Art in the Age’s Sage may have been ahead of its time in this regard, but Träkál and Escubac have shown that botanical narratives are still compelling, juniper or not. Aaron Knoll is a noted gin historian, critic and consultant. He authored 2015's “Gin: The Art and Craft of the Artisan Revival,” which has since been translated into three languages, and additionally co-authored 2013's “The Craft of Gin.” He also founded leading gin website TheGinisIn.com in 2009.